President Porfirio Lobo Sosa announced the creation of a new Intelligence and Investigative division reporting directly to the National Council for Defense and Security. The president said the National Security Council Affairs (CONASIN) will evaluate the candidates to lead this organization. 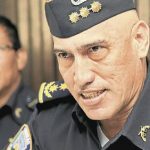 Lobo made the announcement as part of the meeting of the Council of Ministers while reporting the appointment of the Commissioner General Juan Carlos Bonilla Valladares, as the new National police director, replacing Ricardo Ramirez of the (Cid). “There was a change in the National Police Directorate, it is a longer process than I thought, but that’s the way it is I have heard different opinions, of course not all will be well, what is done is done, we must give an opportunity for our friend, there are other commissioners there that can help advance this process, “he said.